The chief god in the mythology of Elephantine Island in the Nile at Aswan was Khnum God, who headed his own triad. He was the god of the cataract region, which included the sources of the Nile guarded by Hapi. There is evidence in the Pyramid Texts that he had been known long before the time of those writings, but no one knows for sure just how long he had been worshipped- Apparently he came to be known as a creator god rather late, but he survived until two or three centuries after Christ. He was rep resented on monuments as a man with a ram’s head, holding scepter and ankh. Often the white crown of Upper Egypt was on his head, and sometimes the crown was decorated with plumes, disk, or cobras. Occasionally a jug of water, representing the Nile, rested over his ram’s horns. Like most chief gods, he was later considered a creator. His followers thought that on his potter’s wheel he molded an egg from which sprang the sun. Wall carvings at various temples in the Luxor area show him sitting at his potter’s wheel on which he is fashioning a child; he was thought of as the master craftsman who molded children out of clay and then implanted them as a seed in their mother’s womb. In this manner he was considered the “father of fathers and the mother of mothers.” It was said he created the gods in a similar manner. 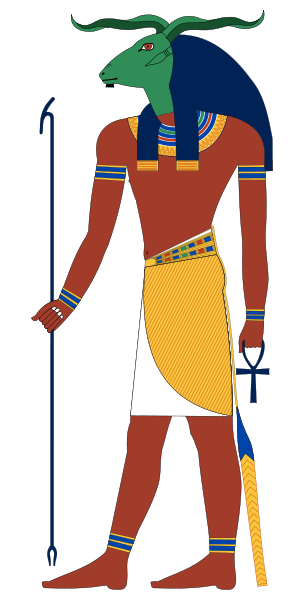 Khnum God was thought to be the combination of the forces that made up the entire world; he was Ra, the sun; Shu, the air; Osiris, the underworld; and Geb, the earth-all wrapped up in one figure. In this form he was represented as a man with four ram’s heads. Khnum Egyptian God fashioning a human and double on this potter's wheel possibly Djoser, who became increasingly concerned about the drought that plagued his country year after year without relief for seven years the Nile had failed to rise enough to flood sufficient land to grow the needed crops, and so the king sent a message to the governor of the south, inquiring about the source of the Nile. On being told that its waters, the source of all good things, came from a double cavern, which was compared to twin breasts, the king decided to visit the Nile god who watched over the river and emerged at the time of the flood. The gatekeeper of the flood was Khnum God, who guarded the doors that kept the water in and then, at the right moment, threw open the doors to let the floods loose on the land. The king went to Elephantine Island and made proper sacrifices to Khnum God who then appeared in front of the royal visitor from the north: “I am Khnum God,” he said, “the Creator. My hands rest upon you to protect your person and to make your body sound. I gave you your heart... I am he who rises at his will to give health to those who toil. I am the guide and director of all mortals, the almighty, the father of the gods, Shu, the mighty possessor of the earth.” The god went on to complain that no one took care to keep his shrine in good repair even though there were plenty of stones in the neighborhood to use in the work. The king promised that this wrong would be corrected, and the god promised in return that the Nile would once again rise every year as it had in the old days. The king ordered a tax to be levied annually on local produce and the proceeds applied to the maintenance of priesthood for Khnum God (dare we now speculate that the entire myth was made up by latter-day king and priests, who conspired to raise a tax and needed justification?). It must be assumed that both king and god kept their promises. The triad of Elephantine was completed by two goddesses associated with fertility. Satis was Khnum’s consort, giver of the waters used in the rituals of purification of the dead. Called dis penser of cool water coming from Elephantine,” she was 1st associated with Isis and Hathor. Her sister Anuket was the third member of the triad. The name of this human-shaped goddess meant “to embrace,” and she was possibly the goddess of lust.